Free real estate marketing tips delivered weekly. Google My Business is a free feature offered by Google to both online and brick-and-mortar businesses. Your business probably has one, whether you know it or not. 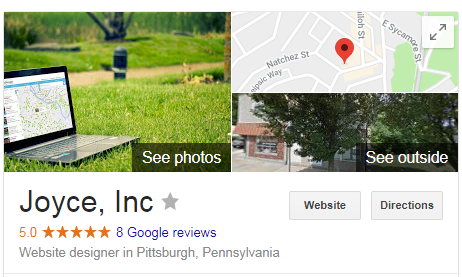 Google My Business information is represented in the right-hand box that appears on certain Google searches. This is called the Knowledge Panel, and contains things like your business' hours, a link to your website, user reviews, photos, and now, Questions and Answers from users. Claiming it gives you control of the details about your business, like your phone number and hours. People can suggest changes to your business' details, which might not always be accurate. If you have the business listing claimed, their changes won't get published unless you approve them. You get notified when a new review is posted. Let's talk about reviews. THEY ARE CRITICAL. Not only are they helpful to potential customers researching your business, but they also help with SEO. Google likes to serve up the best-of-the-best to their searchers, so they give preference to businesses with more 5-star reviews. Reviews are so important that we spend time with our clients developing strategies for getting more glowing reviews. With any review platform comes the risk of negative reviews. It's unfortunate, but it happens. Some reviews are warranted, some are not - and Google gives business owners very little power to actually deal with them. But this is Google's world, and we're just living in it. If it's a good review, thank them! Your customer took the time to shout your praises from the rooftop. A simple "Thank you! We love having you as a customer!" will return the good vibes. They might feel so warm-and-fuzzy that they actually leave another good review on a different platform! If it's mixed, thank them for their feedback. Offer to correct any negative feedback, or provide education. Here's an example of how to do it without sounding patronizing: "Thanks for letting us know you enjoyed your sandwich! We were actually experimenting with a gazpacho recipe, which is why your soup was served cold. We apologize for not letting you know, and we'll be sure to let our servers know to give customers a heads-up on gazpacho day!" Stop. Go get a coffee, or take a deep breath, or whatever you need to do to not freak out. It happens! Don't used a canned response; a customized answer will let the user (and potential customers) know you heard their concerns and want to help. Provide a number to call and a name to ask for (and make sure that person knows about the situation). We have seen critics amend their star-ratings after having a good phone call with the owner or customer service. If you don't think the person is an actual customer, there's not much you can do except respond politely that you don't have their name anywhere in your records. Google has no way of verifying if they're your customer, so they just won't get in the middle of it. If the review contains profanity, threats, spam, or advertising for another company, flag it. If the review was left by a disgruntled employee, flag it. If the review says something to the effect of "I used to work here" Google will generally remove it. Flagging is your best shot to get a review removed, but only if it violates Google's scope of acceptability. Frustratingly enough, not all flagged reviews get removed. Keep flagging. In the meantime, respond politely using the guidelines above - it's better to take the high road than to leave a bad review out there. Also, once you've gotten a bad review, you need to know how to get good reviews to correct the balance! Also, keep an eye on the Q&A section of your Google My Business listing. This is a new (poorly thought-out, to be honest) feature that Google introduced. People sometimes leave remarks in the Q&A section instead of the Reviews section. If the review is in that section, you can't respond with a phone number or link - Google won't show your response. Just say, "Call us for more information! Our phone number is on our website." Remember, you're not always responding for the sake of the reviewer. Sometimes they're a lost cause and there's not much you can do. But you can make sure you're making a good impression on potential customers, and that's even more valuable! Does all of this sound like a full-time job? It is - one that we do for our clients! If you'd like assistance getting more 5-star reviews, responding to negative comments and keeping an eye out for incoming reviews, contact us today.